Bexhill United manager Ryan Light is targeting 11 victories from the football club’s final 12 league matches this season to stand a chance of being crowned champions. 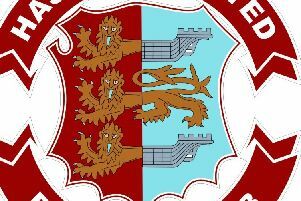 Third-placed Bexhill are six points behind Southern Combination League Division One leaders Steyning Town and one adrift of second-placed Alfold having played a game more than the latter. Speaking after last weekend’s 1-1 draw at home to AFC Varndeanians, Light said: “We’ve got 12 games to go and we’ve got to turn that into probably 33 points I would’ve thought to stand a chance of winning it. Bexhill will only play one of the top four teams in their remaining fixtures and haven’t dropped a point against anybody outside the top five all season. “Our performances have been outstanding - we’ve not been outplayed by anybody - so in that regard you would think we would have a few more points on the board, but we’re not a million miles off where we deserve to be,” continued Light. “Everyone up there is there for a reason. There’s still a lot of points to play for and at this level there’s a lot of factors that come into play towards the end of the season. “Our biggest worry in the last two seasons was that we didn’t score enough goals and we were too inconsistent. After eight successive home games, Bexhill will head to third-from-bottom Southwick tomorrow (Saturday) for what will be their first away fixture since November 10. The match was originally due to have been played on December 15, but was postponed because of a waterlogged pitch after Bexhill arrived at the ground. Jack Shonk is unlikely to be available, but Bexhill hope to have Kion Parchmont in their ranks for the first time. Southern Combination League Division One top half standings (played-points): 1 Steyning Town 20-55 (+33 goal difference), 2 Alfold 19-45 (+36), 3 BEXHILL UNITED 20-44 (+39), 4 AFC Varndeanians 19-39 (+26), 5 Selsey 20-35 (+18), 6 Hailsham Town 21-33 (+9), 7 Littlehampton Town 20-30 (+2), 8 Seaford Town 20-29 (-3), 9 Billingshurst 19-27 (-2).